Home/Voice Search: Can You Be Found? 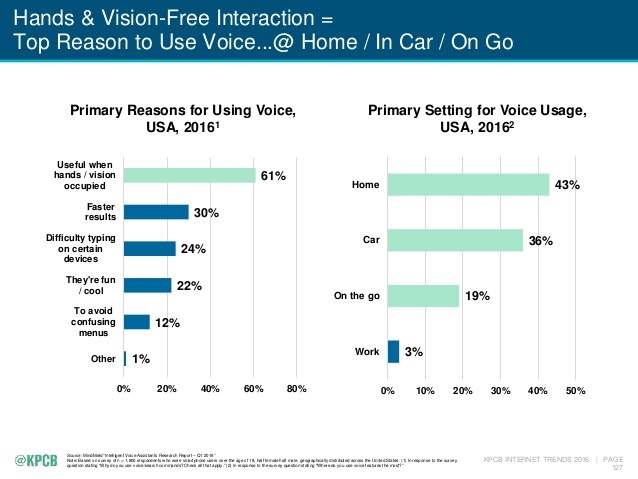 Voice search has recently become more important than ever before. The future of SEO strategies and search optimization in general highly depends on the Internet users’ ever-changing habits, and marketers are advised to take this into consideration. There are a few causes for the enormous growth of the popularity of voice search starting from 2013. The main reason may be the usage of mobile phones, as voice recognition programs have become trendy even among older users. Siri, Cortana, and Google Now can be used for a more convenient browsing experience because it is easier to simply say your question aloud rather than to type it. There is a study showing that 61 percent of voice search users tend to use it in situations when it is not convenient to type, for example, when they are driving or doing household chores. Other people use it for faster results or simply for fun. What is more, a study from Northstar research reveals that more than 40 percent of people use this technology daily. Having in mind that a smartphone is an everyday device for 87 percent of the world’s population, this trend will not disappear anytime soon. However, smartphones are not the only devices suitable for voice recognition. Amazon has released Amazon Echo, a hands-free speaker controlled with voice. It can hear the commands even when loud music is playing. At the same time, Google made its own voice-activated speaker, Google Home. Devices like these allow users not only to play music by uttering simple phrases but also to search for information without the need to type, giving answers immediately. It is evident that search queries are different when people say them aloud rather than when they type them. More conversational language is used, replacing accurate keywords with longer, naturally-flowing questions. A user will more likely say “Where is the nearest Chinese restaurant?” rather than “Chinese restaurants London”. This means that your content should be written in a more natural manner and, instead of an abundance of keywords, there should be questions that would resemble the user’s speech (starting with “where”, “what”, “when”, etc.). Try to implement this into your blogs, posts and other written media. Of course, one of the most important nuances related to voice search is how the voice is captured by the voice recognition program. At the moment, the accuracy of Google’s platform is more than 90 percent, while Baidu has an accuracy rate above 95 percent. A program that would recognize at least 99 percent of the speech is yet to be developed, but it is evident that this can happen really soon, and the market should be ready for that. Now is the best time to start implementing the strategies that voice search experts suggest using. This field of marketing is quite new, but there are a few things that we certainly know: you have to play around with your written content by using long-tail keywords and questions. As voice search is increasing in popularity, it is essential to optimize your website for it if you want to be a strong competitor in the business market.